Despite efforts by the U.S. and Mexico to clean up the Rio Grande, millions of gallons of raw sewage still enter the river each day in Laredo, threatening water supplies for some Texas border towns. LAREDO — When the Rio Grande is swollen with rain, as it was recently in Laredo, it’s hard to tell that more than 5 million gallons of raw sewage spill into its waters every day. But kayak through the little creeks on the side of the river bordering Mexico, and the odor is unmistakable. So are the sights — chocolate-brown water, floating dog carcasses, dead fish. Perez’s town is one of many along the Texas-Mexico border where water supplies are threatened by persistent pollution in the Rio Grande, due, in part, to raw sewage coming from Nuevo Laredo in Mexico. 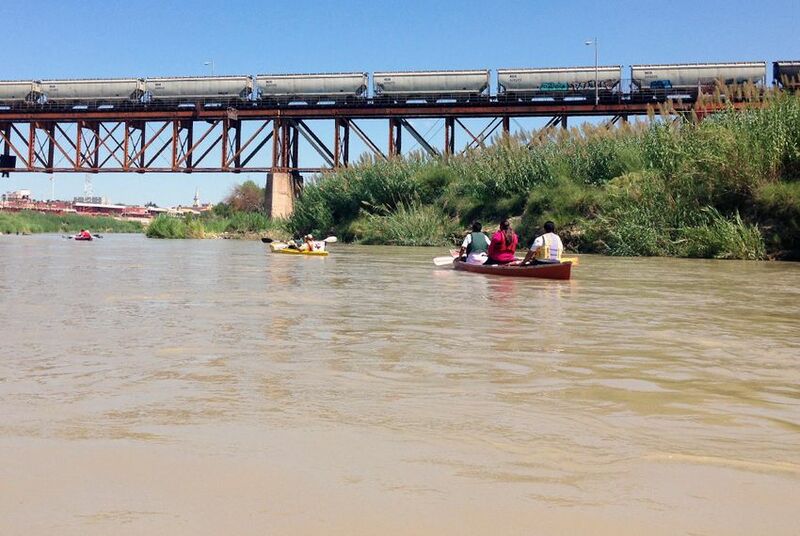 Perez, local officials and environmental advocates along the border are calling for the U.S. and Mexico to tackle the problem of Rio Grande pollution more aggressively. But that’s easier said than done in a time of record stagnation in American government and violence on the other side of the border. Tom Vaughan, an associate professor of biology at Texas A&M International University who has studied the river for decades and was paddling with Perez last month, said E. coli concentrations here are at least thousands of times higher than federal standards allow for swimming and fishing. “In some areas, they’re in the millions,” he said. Because the river straddles two borders, getting things accomplished here is more complicated, said George Frisvold, a professor at the University of Arizona who studies international environmental policy. While the federal Environmental Protection Agency would typically be involved in such an issue, here it must also be joined by the U.S. State Department’s International Boundary and Water Commission and a Mexican counterpart, which means more bureaucratic delays. Two decades ago, many Mexican border communities treated little or no wastewater and instead dumped it into the Rio Grande, where doctors warned it could kill swimmers. In Nuevo Laredo alone during the mid-1990s, an estimated 25 million gallons of raw sewage entered the river each day. Momentum to clean up the river increased in the wake of the North American Free Trade Agreement, which both countries signed in 1994. Two years later, a binationally funded wastewater treatment plant went online in Nuevo Laredo. But not all the city’s infrastructure has been updated, and broken pipes litter its sewer system. That means 5 million to 6 million gallons of raw sewage still enter the river from Nuevo Laredo each day. Treating such dirty water is a hefty expense, and the water intake plants serving Rio Bravo and the neighboring town of El Cenizo in Texas haven’t always been able to keep up. Perez said she became concerned about the water when her children fell ill this summer with symptoms doctors told her were consistent with sickness from E. coli. At the doctor's office, she noticed many other waiting patients with the same symptoms. "I thought, 'Oh my God, it's an epidemic,'" she said. Although the Texas Commission on Environmental Quality says the water is now safe to drink, Perez refuses to give even her dog tap water. She said many other residents are also suspicious and have demanded more proof that the water isn’t polluted. The problem has been bad enough that the International Boundary and Water Commission, which is headquartered in El Paso, opened an office in Laredo last year to deal just with water quality issues. Adolfo Mata is head of the field office, and meets regularly with Mexican officials. Mata said that the treated water coming from Nuevo Laredo's wastewater treatment plant is “good, clean water,” and exceeds the standards for treated wastewater in both the U.S. and Mexico. But major issues persist, he acknowledged. In one creek along the city’s banks, Vaughan estimated that a single broken pipe is believed to spill out 1 million gallons daily. The broken pipe is on private land in Nuevo Laredo, where the owner is demanding compensation before allowing anyone to repair it. “But that issue is being dealt with. Obviously it’s an issue that the Mexican government has to deal with, and it’s in their hands,” Mata said. For Vaughan, the progress isn’t fast enough. Frisvold said it was unlikely that there would be a big push to clean up the Rio Grande unless the federal government begins to move past budget issues, which have dominated national politics in recent years. The only other event that might prompt swift action, Frisvold said, is a massive sewage spill cause by a dysfunction or a storm.